The former Ledyard lawyer found guilty of convincing her boyfriend to hire a hit man to kill her brother-in-law, and then fleeing to Ireland to avoid prosecution, is again trying to have her conviction and life sentence thrown out. Beth Ann Carpenter, 53, is going to federal court in a long-shot effort to have her state court conviction overturned. Her lawyer, Norm Pattis, filed the federal habeas corpus petition on Wednesday. In it, Pattis argues that Carpenter's trial lawyers made mistakes that resulted in Carpenter's conviction. Similar claims have been raised with appeals and a state court habeas corpus petition, and both times judges rejected them. "That case continues to haunt my office," Pattis said Wednesday. 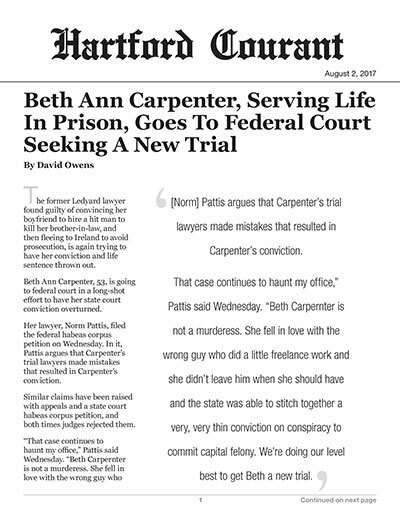 "Beth Carpernter is not a murderess. She fell in love with the wrong guy who did a little freelance work and she didn't leave him when she should have and the state was able to stitch together a very, very thin conviction on conspiracy to commit capital felony. We're doing our level best to get Beth a new trial." Carpenter was convicted of murder and conspiracy to commit capital felony in 2002 for plotting with her lover and boss, Haiman Clein, to kill her brother-in-law, Anson "Buzz" Clinton, over Clinton's alleged abuse of his daughter. Clinton was fatally shot in 1994 in East Lyme. Carpenter fled to Ireland after the killing and was extradited only after U.S. officials agreed not to seek the death penalty. Clein is serving 35 years in prison, and hit man Mark Despres is serving 45 years.